To plan this trip, I first looked at Amtrak’s web site to see if any Rail Sale Seats were available. Since none were, I decided to look into the possibility of buying a ticket through Amtrak’s store on E-bay. It turns out that there was such a special for Train #48, which would allow me to ride the train to New York from Buffalo for the amazingly low price of $19.00! I knew this was a deal that I had to take advantage of since I knew there was no other way I’d get a ticket that cheap! I bought the ticket through the “Buy It Now” Option on E-bay. Amtrak called me back the following day to confirm the auction and put the ticket through their reservation system. This was a very quick and easy process, and the Amtrak agent was very professional on the phone in handling the reservation. My next ticket would be on the Acela Express, I decided to ride it on this trip because Amtrak recently started a $99 or less special fare between New York and Boston with an upgrade to First Class for just $50 more. I decided that since I had received such a huge deal on the Lake Shore, that I had to take the Acela and ride it in the Grand Style, FIRST CLASS!! The ticket ended up costing $142. My next train was supposed to be The Westbound Boston Section of the Lake Shore Limited - Train #449. 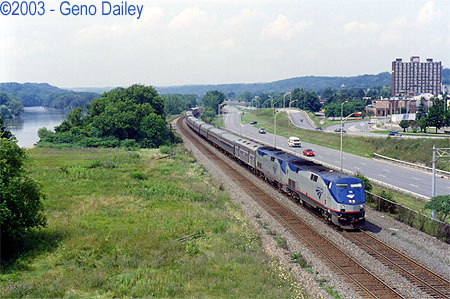 I would ride from Boston to Schenectady where I would be staying for 4 days to railfan and visit some friends. This would end up being where the trip got interesting. On July 9th, a few weeks after making the reservation, I got a call from Amtrak saying that due to trackwork by CSX, Train #449 was replaced by a BUS! BUMMER! I had chosen to ride this train so that I could ride between Boston and Springfield since I haven’t covered that trackage as of yet, but oh well, we can’t control what CSX does and we’ll just have to live with it. I would end up riding home from Schenectady on the Lake Shore Limited. The total cost for all of my tickets was $231.20. Segment 2: New York City To Boston on Amtrak's Acela Express - FIRST CLASS!! !